If you have a question or experience a problem with ASAP Utilities then please verify if there is already an answer to your question or solution for you problem in our list of frequently answered questions. How to upgrade to the latest version of ASAP Utilities. Is my Excel 32-bit or 64-bit? Basically, if you can run MS Windows Excel on your system then you meet the minimum requirements to run ASAP Utilities. ASAP Utilities needs approximately 41 MB of disk space (18 MB for the program files and 23 for the PDF User Guide). The recommended minimum screen resolution is 1024 x 768 pixels. Just like most programs you must be logged in as an administrator or as a member of the Power Users group to run the setup or you can choose to run the setup as administrator. When the installation is finished every user on the computer is able to use ASAP Utilities. This process is described in the User Guide which gives additional information for system administrators. In addition, we also have a non-admin setup available for Business clients. ASAP Utilities works with all Excel languages. The ASAP Utilities user interface and help is available in the languages English, German, Spanish, French, Italian, Dutch, Portuguese (Brazil) Russian, Chinese (Simplified) and Japanese). 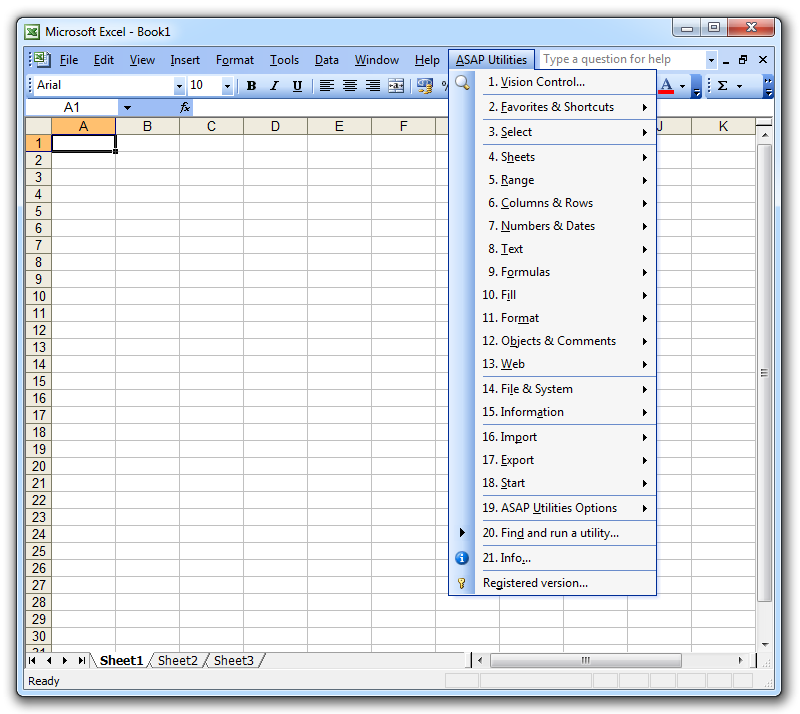 This means that you can use ASAP Utilities in the English version of Excel but also in international versions such as German, French, Italian, Dutch, Korean, Danish, Spanish, Polish, Russian, Chinese, Arabic, etc. etc.